We get frustrated when it seems like something we know we have covered is met with a sea of blank faces, as if we are just making it up. 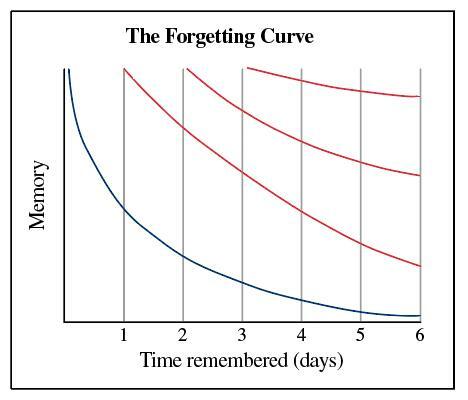 Forgetfulness is a huge problem for our students as it creates such a block to real progress. The thing is, forgetfulness is not (always) because our students are being dopey, it’s not (always) because they are not trying, but certainly it is always because they are human, and human memories do not last. This is the reason why, try as I may, I cannot recall anything about the British Agricultural Revolution, whereas I have no problem whatsoever with the finer points of the mark scheme for an A level mathematics exam: one of these things is rehearsed in my mind frequently, the other I haven’t touched in 20 years. Cognitive scientist Daniel T Willingham points out that learning is hard work and, since “memory is the residue of thought”, it is quite clear that if you don’t think about something much you won’t remember it (Willingham, 2010). When we, as teachers, stand in our classrooms before a group of students we have the benefit of expertise, we know our subject inside out and everything fits together in our minds like a fully assembled jigsaw. This can make it hard to realise just how difficult our subject is for our students who are looking at the two or three pieces we place in front of them and are in the process of adding these to their jigsaw without even knowing what picture they are trying to make (this idea is termed the “curse of knowledge”). When, some lessons later, we move them onto a different part of the jigsaw they have the struggle of fitting the new pieces together when the earlier ones (which are often prerequisite to the new ones) are still not fully in place. We do nothing to help the problem when we don’t give our students the opportunity to remember old content. Indeed, over the last decade such practice has been actively discouraged with the need to evidence “rapid and sustained progress” in even a single lesson. The result is that good early performance, coupled with a desire to show that our students have quickly moved past the “easy” work to the “more challenging” work, means our students can be moved on before they are ready. In doing so, they quickly forget. “We did this last year, I expect you to know it,” doesn’t cut it. Students need regular opportunity to revisit past content. This principle is called spaced practice and is one of the Learning Scientists’ Six Strategies for Effective Learning (see further information). Essentially, if you want your students to build upon prior learning and remember what you’ve taught them, you need to keep coming back to it. How you do that is up to you: activities in lessons, or homework following a schedule of repeating topics. You don’t have to do a whole lesson on something, little and often is much better. Perhaps you could make quick quizzes a regular feature of your lessons, designing them so that there are increasingly large gaps between recall of each topic but ensuring that nothing is left too long. Quizzing has the added benefit of being particularly good for learning (see below). Another of the aforementioned evidence-based six strategies, retrieval practice has been shown to help students to remember what they have learnt more effectively than simply telling them things again. When they have to make the effort to recall learning the effect is stronger. You could get students to retrieve learning by writing down or drawing everything they can about a topic, before spending time going through the details and getting them to annotate or expand their work. Another successful way to retrieve learning is through regular low-stakes quizzing (the low stakes are important – this is not supposed to be stressful). Quizzing has the added benefit of increasing students’ motivation as they see their scores go up over time. What your students think about they will remember, what are they thinking about when they are in your lessons? Are the walls covered in distracting pictures? Are the tasks you set easy to follow and do they get students thinking about the thing/s you want them to learn? If the instructions take more thought than the content then it’s the wrong way round. If the colouring in of a poster or design of a presentation takes more effort than selecting and presenting quality content, then it’s the wrong way round. Be honest with yourself, do you have any annoying habits when you’re talking? Do you end every sentence with “okay?” or take 50 words when 10 will do? We have all had those points of sudden self-awareness, when we realise we, like, don’t talk, like, clearly enough (that one was mine when I started teaching) – if you know what your bad habit is, practise until you lose it. Ebbinghaus spoke of “overlearning” something: practising until you can’t forget it. This is often an undervalued concept in our schools. In many subjects, especially hierarchical ones such as mathematics where each topic builds upon the previous ones, repetition and overlearning can make a massive difference to a student’s success, and this is especially true with students who find the subject more difficult or who forget more quickly. This repetition can take many forms – songs, drills, quizzes (on paper and online) – and the more ways you can present the same information to students the more likely they are to remember it. There are many other factors in improving our students’ chances of success in remembering what they are learning and a number of books out there on this very topic (see resources below). We could do much worse than designing our lessons and schemes of work with memory in mind. Why Don’t Students Like School: A cognitive scientist asks questions about how the mind works and what it means for the classroom, Daniel T Willingham, Jossey-Bass, 2010. Maths quiz resources include Numeracy Ninjas (www.numeracyninjas.org) and Times Tables Rock Stars (https://ttrockstars.com). General quiz resources include Memrise (www.memrise.com) and Quizlet (https://quizlet.com). For more on how students learn and the secrets to accessing their long-term memories, see Matt Bromley’s current SecEd series via http://bit.ly/1Uobmsl (September to November 2017). For starters, try Make it Stick (Brown, Roediger & McDaniel, 2014), Memorable Teaching (Peps Mccrea, 2017), or What Every Teacher Needs to Know About Psychology (Didau & Rose, 2016).